Core Economics is an open-source economics textbook project based in Europe which has produced an innovative approach to teaching economics. They produced the graph below which shows “the destination of investments by US companies when they invested directly in other companies abroad between 2001 and 2012.” This is interesting for a couple reasons. First, although America has higher average income than almost all of these countries, America’s much higher inequality helps explain why manufacturing wages are lower than in so many other countries. Second, the majority of American investment goes to countries with higher manufacturing wages than America, so the data doesn’t show that America has been primarily outsourcing to poor countries. The combined investment to all of Africa, India, and China together merely accounts for less than 4% of US foreign investment even though the vast majority of all humans live in those three areas. Luxembourg is much richer than the US and gets nearly 9% of US investment than that even though Luxembourg is one of the smallest countries in the world. Why Luxembourg?? It is hardly more than just a city state. Most people think Americans are outsourcing a lot of wealth to poor nations, but the majority of US foreign investment goes to countries which are richer than the US in the kind of income that matters most for international trade. Most of the rest goes to middle-income nations. Very little goes to poor nations. United Nations Conference on Trade and Development. 2014. Bilateral FDI Statistics. Note: Data is for US FDI flows abroad. 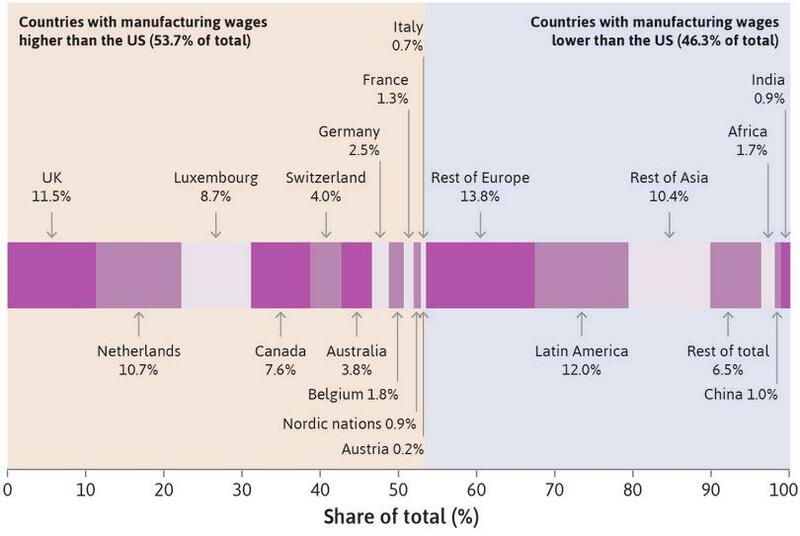 The countries shown to have manufacturing wages higher than the US are those that are classified by the US BLS International Labor Comparisons as having higher hourly compensation in manufacturing than the US on average over the 2005–09 period.